General manager Tim Murray completely remade both the coaching staff and the roster, hiring Dan Bylsma, a Stanley Cup winning coach in Pittsburgh, as the new coach, replacing the popular Ted Nolan. Bylsma didn’t work any wonders, but the team looked more organized under his leadership and definitely improved over the course of the season. Draft day was hectic for Murray, and he parlayed his treasure chest of top picks into a future superstar, Jack Eichel, with the second overall pick, and a couple of trades that yielded young but experienced players. His deal with Colorado to bring in Ryan O’Reilly and Jamie McGinn was a steal, although later dealing McGinn away was disappointing. O’Reilly is a brilliant young leader who should eventually become team captain. The other trade, for goaltender Robin Lehner, gets an “incomplete” grade, as injuries kept the big goalie from playing enough to prove his worth. Eichel, O’Reilly and 2014 top draft pick Sam Reinhart head a roster of forwards that appears to be headed for big things next year. That trio, along with another Murray trade acquisition, Evander Kane, gave the Sabres a quartet of 20 goal scorers who figure to only get better. It was almost a totally lost season for Tyler Ennis, due to concussion issues, but if he can regain his past form the club will have another scoring threat. After slow starts, two younger veterans, Marcus Foligno and Johann Larson, improved their all-around games and started to contribute offensively. 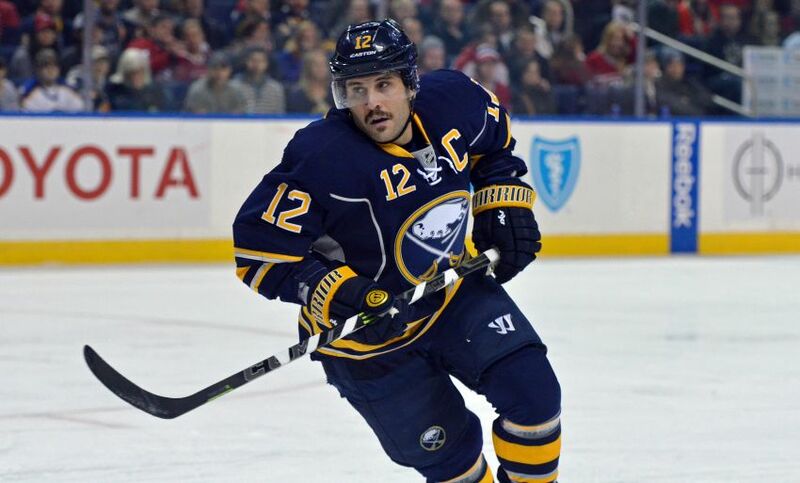 The same could be said for two of the team’s older veteran leaders, Matt Moulson and captain Brian Gionta. Zemgus Girgensons was a workhorse under previous coach Ted Nolan, but his play dropped off in 2015/16 and he’ll need to rebound next season. It’s hard to imagine the Sabres re-signing veteran David Legwand, who’ll be a free agent, especially with young up-and-comers like Hudson Fasching and Justin Bailey competing for roster spots next year. 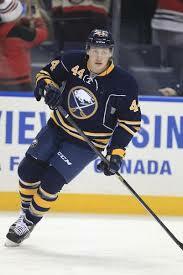 One player who is the type of player every team needs, and the Sabres should keep around, is Nicolas DesLauriers. 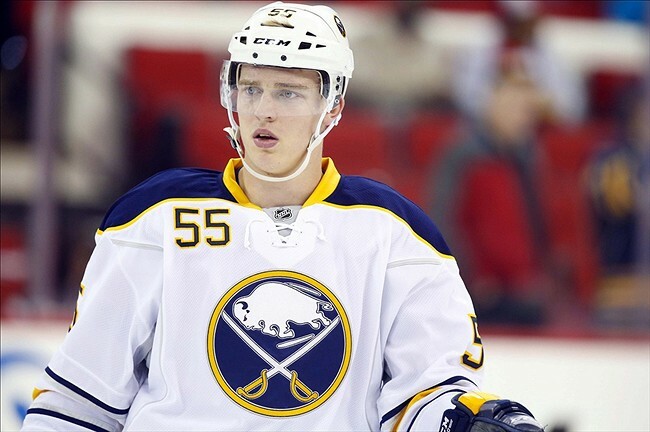 The Sabres have three solid young defensemen to build around heading into the future in Rasmus Ristolainen, Zach Bogosian and Jake McCabe. Another youngster, Mark Pysyk, is a probably a tier below that top three talent-wise but should be a regular competitor in 2016/17. Among the three veteran D-men on the roster, Josh Gorges, being an alternate captain, is most likely a lock to stick around next year, while the other two, Cody Franson and Carlo Colaiacovo, are stopgap players who likely will be replaced next year. In Franson’s absence at the end of the year due to injury, rookie Casey Nelson stepped in and did an admirable job, staking a solid claim to a regular spot on defense next year. Lehner is one of GM Murray’s prize acquisitions and the type of big, intense goalie he likes, but overall he was overshadowed by free agent-to-be Chad Johnson this season. Lehner battled injuries, and in his absence Johnson proved his worth as a starting NHL netminder, posting a winning record for a losing, non-playoff team and gaining the total confidence of his teammates. It will be hard for Murray to let him walk away in the off-season. Linus Ullmark also played pretty well in limited opportunities, while newly signed Jason Kasdorf was shaky in his lone late-season start. He will definitely need more seasoning in the minors before he’s ready for the NHL. 1. 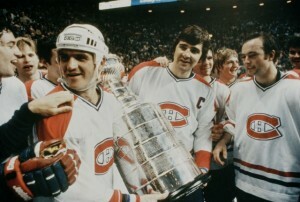 Flying Frenchmen – this nickname has been affiliated with the Montreal Canadiens dating back as far as 1917, but the “Flying Frenchmen” I remember are the 1970s Canadiens, featuring players like Guy LaFleur, Larry Robinson, Steve Shutt, Bob Gainey, Rejean Houle, Jacques Lemaire and Serge Savard. 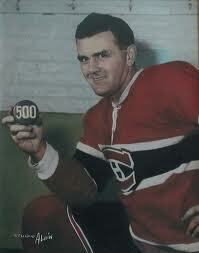 The ultimate “Flying Frenchman” on this club was LaFleur, and the Canadiens won 5 Stanley Cups during his career. 2. Broad Street Bullies – this would be the 1970s Philadelphia Flyers, who won back-to-back Stanley Cups using a rugged style of play that was big on intimidation and short on style. 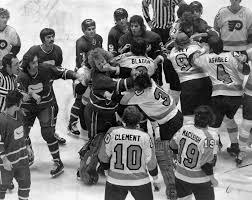 They were regularly the most penalized team in the NHL, and most of those penalty minutes were fighting majors or roughing minors, featuring players like Dave “The Hammer” Schultz, Andre “Moose” Dupont, Don “Big Bird” Saleske, Ed Van Impe and captain Bobby Clarke, the ultimate instigator. 3. 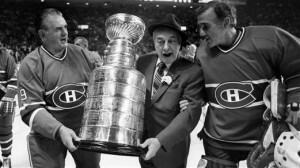 The French Connection – right around the time that the movie “The French Connection”, starring Gene Hackman, was hitting the theaters, Buffalo Sabres’ GM Punch Imlach assembled a line of three French-Canadians. 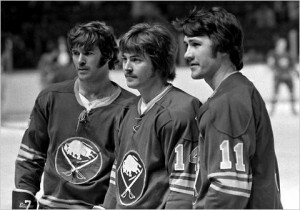 Centered by Gilbert Perreault with Rene Robert and Richard Martin on the wings, the trio was tagged with the French Connection nickname and became one of the most prolific lines in NHL history. 4. 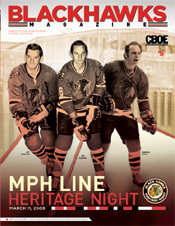 MPH Line – if you were to try to name a top line of the 1960s and ’70s Chicago Black Hawks that was named after the players’ last initials, you’d probably guess that the “M” was for Stan Mikita and the “H” for Bobby Hull, but you would be wrong. The players who made up this famous line were Pit Martin, Jim Pappin and Bobby’s brother, Dennis Hull. 5. 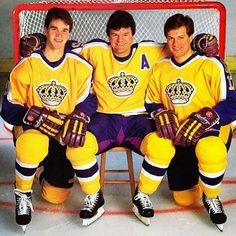 Triple Crown Line – this line got their nickname because of the team they played for – the Los Angeles Kings, whose uniforms featured a crown logo. Consisting of Dave Taylor, Charlie Simmer and Hall of Famer Marcel Dionne, they were a prolific scoring line that was the first line in NHL history to have all 3 members score 100+ points in a single season. 6. Big Bad Bruins – this nickname is used on the Boston Bruins’ franchise to this day, for their rugged style of play, but was really earned in the 1970s when the team had players like Terry O’Reilly, Wayne Cashman, Carol Vadnais, John Wensink and Mike Milbury, and even carried some of their battles into the stands with opposing fans (see picture above). 7. Les Habitants – this nickname for the Montreal Canadiens is a favorite of their French Canadian fans in Quebec. Like the New York Yankees in baseball and Boston Celtics in basketball, the Canadiens are the standard for their sport that all other clubs hope to be. They are one of the oldest North American sports franchises, and have won a total of 24 Stanley Cup championships. 8. Broadway Blueshirts – this is a long-time nickname New York fans have for their Rangers, an original six franchise that played in the 1920s at the old Madison Square Garden, which was just blocks away from Times Square and the Broadway scene. They were a huge fan favorite in that Roaring Twenty era, having won the Stanley Cup in their second year of existence. 9. Desert Dogs – when the old Winnipeg Jets’ franchise made the unlikely move to the desert to become the Phoenix, and later Arizona Coyotes, they were tagged with this nickname. Coyotes have long been known as “desert dogs”, so the nickname fit the new hockey club when it changed locations in 1996. 10. 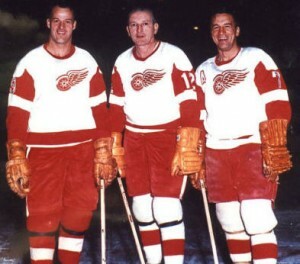 The Production Line – this line, consisting of hockey legends Gordie Howe, Sid Abel and Ted Lindsay of the Detroit Red Wings, was named after their home city’s long-standing automotive industry connection. They are considered one of the greatest lines in hockey history, with all three members having been elected to the sport’s Hall of Fame. Now that the dust has cleared from 2013’s front office fiasco involving Pat Lafontaine’s abrupt departure, it’s clear who is running the Sabres’ hockey operations – general manager Tim Murray. It was probably unfair of Murray to jettison Nolan after completely dismantling the team’s roster as the season went on, as Nolan was put into an almost impossible situation. That being said, Murray, by making the move, is being consistent with how he has made decisions so far, meaning that sentiment is not part of his criteria. Murray, at his post-season press conference, intimated that he and Nolan didn’t communicate much, and that he wanted a better “fit”. He also said that, to a man, the players praised Nolan as a “good man”, yet there wasn’t much of an uprising among those players when Nolan was fired. Whoever Murray brings in to coach the team is going to have to be a guy whose strength is developing young players into winners, since that is clearly the Sabres’ blueprint moving forward. There is general consensus among hockey experts that Buffalo’s prospect pipeline is the strongest of all teams in the league, with more to come in this year’s draft. Of course, Buffalo, over the years, always seems to have all kinds of stars-in-waiting in their minor league system, yet those players either totally fall off the map, or never develop into much more than “average” players at the NHL level. Consider what Nolan had to go through as far as goaltending was concerned in his two seasons. Since 2013, Murray traded Ryan Miller, Jaroslav Halak (now starting for the Islanders in the playoffs), Jhonas Enroth and Michael Neuvirth. 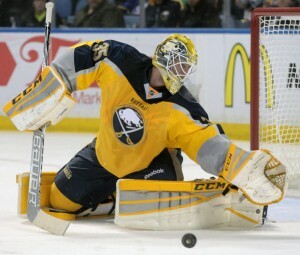 He has been forced to play Enroth, Nathan Lieuwen, Connor Knapp, Neuvirth, Andrey Makarov, Matt Hackett and Anders Lindback. 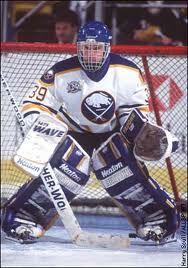 Chad Johnson, acquired from the Islanders, would have probably played also but wound up getting hurt. One of the amazing things about this season was that whatever goalie the Sabres threw into the net, eventually they looked great. Lindback, a throw-in in the big trade Murray made to acquire Evander Kane and Zach Bogosian from Winnipeg, wound up finishing the year as the starting netminder and is most likely the favorite to win the job next year unless one of their prospects steps up and claims the job. I think it’s telling that when Nolan was fired, his staff also was let go, with the exception of goaltending coach Arturs Irbe, who apparently worked magic with whatever goalie he was told to coach that week. Despite finishing the year strongly, Lindback has always been considered a journeyman, so it’s likely that even if he starts 2015 as the starter, Buffalo’s long term answer at the position is far from settled. When you’re the last place team in the entire league for two consecutive seasons and one of the lowest-scoring teams in NHL history, there is no player among the forward ranks whose job is safe. So who will still be on the roster next year from this group, and what will the lines look like, especially with a new coaching staff? 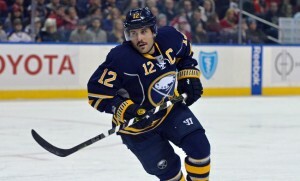 Good candidates to remain are team captain Brian Gionta, who started the season slowly but finished strong and did a terrific job, as captain, of holding the locker room together in a putrid situation (GM ripping apart the roster, fans purposely rooting for the opponents to get a higher draft pick, etc. ), Tyler Ennis, one player who shows some real offensive skills, Marcus Foligno, who has underachieved so far but looks to be finally developing, Nic Deslauriers, a banger who was the only Sabre to play all 82 games this season, and Zemgus Girgensons, a budding star. Johann Larson brought his “A” game late in the year and should have earned a long look from the next coaching staff, and Mikhail Grigorenko is way too young and has far too much potential to give up on yet. The newly-acquired Evander Kane and top prospect Reinhart are likely to play key roles also. Matt Moulson is an alternate captain and has a multi-year contract, but he needs to provide a little more scoring to secure a top-line role, in my opinion. Phil Varone, up and down from Rochester during the season, showed enough to get a look. How much room there is on the team for heart-and-soul guys like Pat Kaleta, Matt Ellis and Cody McCormick remains to be seen. Anybody not mentioned (Cody Hodgson) was not included for good reason – they’re not seen here since they were invisible for all or most of a lost season. This group figures to be a strength of the team in upcoming years. Murray gave up a lot to acquire Kane and Bogosian, but a straight up comparison of Bogosian to Tyler Myers, who was shipped to Winnipeg in the deal, is an upgrade for Buffalo. Bogosian immediately stepped in as a pillar on the blue line, as opposed to the yearly waiting for Myers to grow from a boy to a man. Rasmus Ristolainen is an emerging star, and another youngster, Nikita Zadorov, could be even better when he matures some. Mike Weber, voted by his teammates as their unsung hero, is a solid defensive defenseman, and alternate captain Josh Gorges is a good player and locker room leader. Tyson Strachan, Andre Benoit and Andrej Meszaros are older, stop-gap players who could be unseated next year by younger, better options currently in Rochester, like Chad Ruhwedel, Mark Pysyk and Jake McCabe. 1. Gordie Howe “Mr. Hockey” – let’s face it, when you play a professional sport until age 51, in five different decades, you deserve to have a nickname that starts with Mister and ends with your sport. Howe is generally regarded as one of the NHL’s best ever, and was the idol of other greats who played after him, most notably Bobby Orr and Wayne Gretzky, who is next on this list. 2. Wayne Gretzky “The Great One” – Gretzky is without a doubt the most dominating player in NHL history, and is really the guy most deserving of the “Mr. Hockey” moniker, but he always demurred to his idol, Howe, and was as humble as he was great. 3. Bobby Hull “The Golden Jet” – with his speed and blonde locks, he had the perfect nickname. 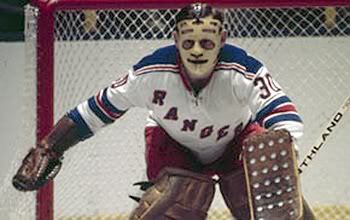 He was also known for having one of the game’s hardest slapshots. His son Brett also had a highly successful NHL career and became known, naturally, as “The Golden Brett”. 4. The 1970s Philadelphia Flyers – I cheated with this one a bit. The team itself had a nickname – “The Broad Street Bullies”, that will surely appear on a future list post I do of team nicknames. 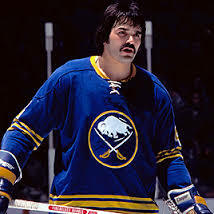 However, they also deserve recognition on this list of individual nicknames, as their roster included gems like Dave “The Hammer” Schultz, Bob “Hound Dog” Kelly, Andre “Moose” Dupont and Don “Big Bird” Saleski. 5. Dominik Hasek “The Dominator” – his career blossomed when he arrived in Buffalo and eventually took over the starting goaltending job from Grant Fuhr, and he led a sparsely talented Sabre team deep into the playoffs numerous times with his stellar play. He was rewarded years later when he went to Detroit and helped the Red Wings win a Stanley Cup. 6. Nikolai Khabibulin “The Bulin Wall” – the Russian goalie has had a solid NHL career, and became the first Russian netminder to win a Stanley Cup when he backstopped the Tampa Bay Lightning to a title in 2004. 7. Maurice “The Rocket” Richard – one of the most famous players on probably the most legendary NHL team, Richard was the first player to score 50 goals in a single season, and the first player in league history to reach 500 career goals. His younger (and shorter) brother Henri also played for Les Habitants, and was known as “The Pocket Rocket”. 8. Yvan Cournoyer “The Roadrunner” – he played for the Canadiens from 1963 until 1979, an era when the franchise dominated the league with speed and skill, and were known collectively as “The Flying Frenchmen”. They won 10 Stanley Cups during Cournoyer’s career, and his nickname obviously labeled him as one of the team’s fastest skaters. 9. Curtis Joseph “Cujo” – his nickname was derived from the first two letters of his first and last names, but he embraced the comparison with the snarling, rabid dog from the Stephen King movie by wearing a mask painted with the movie character canine on it. 10. Jerry “King Kong” Korab -a big, intimidating defenseman, he earned his nickname by gaining a reputation as one of the league’s toughest fighters during his career. It helped that he looked like a big gorilla. It took a lot of crazy turns but the Sabres’ front office situation seems fairly settled now, more or less. On the negative side, the situation involving Pat Lafontaine’s abrupt departure was never fully explained, and the man he brought in to mentor him, veteran hockey man Craig Patrick, seems to have disappeared into the woodwork. Does he still work for the Sabres or not? On the positive side, the man Lafontaine hired as general manager, Tim Murray, has slid comfortably into his position and slowly began the work of trying to rebuild the team. He made some bold, creative moves at the trade deadline to stockpile young prospects and draft picks, and completed his most important task – removing the “interim” tag from coach Ted Nolan’s title. Nolan didn’t win a whole lot of games in the time he had coaching the club this year and it’s obvious better players will be required, but he deserved the chance to help improve the team over the long haul just with the improvement he managed to coax out of players like Drew Stafford, Tyler Myers and Tyler Ennis in his short tenure. Nolan’s strength as a coach is in motivating and molding young players, a trait that fits what the team will need in the next few seasons. He should be able to do an even better job next season, once he rounds out his assistant staff with coaches he’s comfortable with. 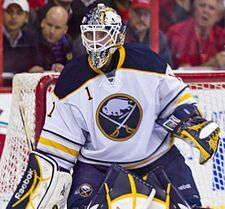 Buffalo’s goaltending situation went from solid at the start of the year, with one of the game’s best, Ryan Miller, to a state of flux by season’s end. The team went through an NHL record nine different goalies, including Miller and Harbor Center employee Ryan Vinz, who dressed as a backup the night Miller was traded. Jhonas Enroth, apparently, will enter next season as the incumbent starter, since that’s the spot he held after Miller left and until he was injured and out for the season. Matt Hackett, Michal Neuvirth, Nathan Lieuwen and Connor Knapp all took turns in net toward the end of the season. It looks like Enroth, Hackett and Neuvirth would be the prime candidates to battle for the two open goaltending spots on the Sabre roster next year, although the others could help their chances with a decent playoff showing in net in the AHL playoffs for Rochester. Buffalo also has young Swedish prospect Linus Ullmark in their system. He’ll be 21 in July but doesn’t appear to be on the team’s radar yet. After scoring the least amount of goals of any NHL team in the post-expansion era, the Sabres’ biggest glaring need is for some forwards with offensive talent and scoring ability. The forward ranks are loaded with players who would be third and fourth line players in the league’s better organizations. There are some potentially good players in their system, but they’re all teenagers who likely won’t be ready to help the team in 2014/15, like William Carrier, Nicholas Baptiste, J.T. Compher, Hudson Fasching and local products Sean Malone and Justin Bailey. Johan Larsson could emerge, although he didn’t show much in the way of a scoring touch in the short stint he had with the Sabres this year. It would help if a couple of Darcy Regier’s top draft picks, Joel Armia and Mikhaill Grigorenko, would develop into something. Armia is playing in his native Finland and not exactly putting up great numbers, while Grigorenko has talent but hasn’t shown much maturity. As for the current roster, the “keepers” appear to be young Zemgus Girgensons, Cody Hodgson, Stafford, Ennis, Nic Deslauriers and maybe Chris Stewart, who seems to be the type of player Nolan likes, and who has shown some ability to score. Deslauriers’ physical style surely endeared him to Nolan also. Players like Brian Flynn and Torey Mitchell are worth keeping as role players. It’s almost certain Ville Leino, a big free agent signing a couple years ago who has produced next to nothing, will be gone. Then there’s Marcus Foligno, who you would hope would develop into a scoring power forward but has been wildly inconsistent. It’ll be interesting to see how Nolan uses Pat Kaleta when he returns from injury. In any event, other than Girgensons there probably isn’t one forward on the roster that Murray wouldn’t consider trading at this point if he thought he could improve the team. 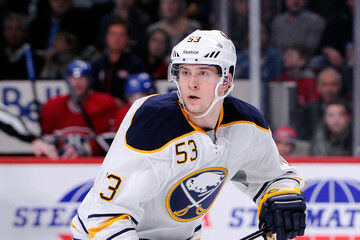 Defense is a position Buffalo seems to be well-stocked in going into the future, to the point where Murray felt comfortable trading a pretty good prospect away in Brayden McNabb at the deadline. Tyler Myers has been mostly a disappointment so far but his play improved a lot under Nolan before he got hurt. Christian Ehrhoff was signed as a free agent the same year as Leino, and has at least given the team some return on their investment. Jamie McBain and Mike Weber play differing styles but seem to be serviceable players. The future of two other veteran defensemen – Alexander Sulzer and Henrik Tallinder, are in question if the team plans to rebuild with youth. Three of Regier’s draft picks, Jake McCabe, Rasmus Ristolainen and Nikita Zadorov, appear to have bright futures but it’s uncertain if they’re quite ready for prime time yet. However, management may decide to take their lumps with the younger players next season on the back end. If that’s the case, players who’ve been up and down between the big club and Rochester, like Chad Ruhwedel, Mark Pysyk, Ristolainen and Zadorov could claim roster spots instead of the crusty veterans. So this is what “Hockey Heaven” is supposed to look like? That’s a question loyal Buffalo Sabres’ fans have to be asking after a crazy weekend of turmoil surrounding the team. It’s been quite awhile since I posted anything regarding the local NHL team, in fact, the last was a 2012-13 season review of the team published last May. Since then, the creator of that “Hockey Heaven” title, owner Terry Pegula, finally came to his senses and got rid of both GM Darcy Regier and coach Ron Roulston, and made what looked like a brilliant move by hiring Pat Lafontaine to guide the franchise back to respectability. Dumping the previous regime amounted to lifting the Sabres out of a “Night of The Living Dead” era with the placid Regier and Roulston, and reviving them behind a well-respected figure from the team’s past in Lafontaine. It was a terrific PR move, made even better when Lafontaine brought in Ted Nolan along with him to become interim coach. Then a veteran Hall of Fame front office man, Craig Patrick, was added to the mix as an advisor. Lafontaine, after a careful search, hired Tim Murray from Ottawa as the team’s new general manager, and an impressive executive team was complete. Everything looked rosy, until a whirlwind weekend of events shook the team to its’ core. Those events were a blockbuster trade that sent the face of the franchise, goaltender Ryan Miller, and team captain Steve Ott to the St. Louis Blues for what appears to be an impressive haul in return – goalie Jaroslav Halak, young forward Chris Stewart, junior prospect William Carrier, a 2015 first round draft pick and a conditional 2014 pick – and the abrupt resignation of Lafontaine. 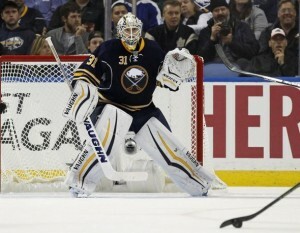 The two events sent shock waves through the Sabres’ fan base. The trade was something that was mostly expected, so the reactions were mixed between negative and positive. Lafontaine’s departure, however, was stunning and drew complete negative reaction. Where does the team go from here? To me, once the dust settles and the trade deadline passes, there are two people who will be the most important in shaping the future success of the team, Murray and Nolan. Here’s my take on both of them: Murray deserves credit for pulling off the blockbuster trade in his first major move as GM. 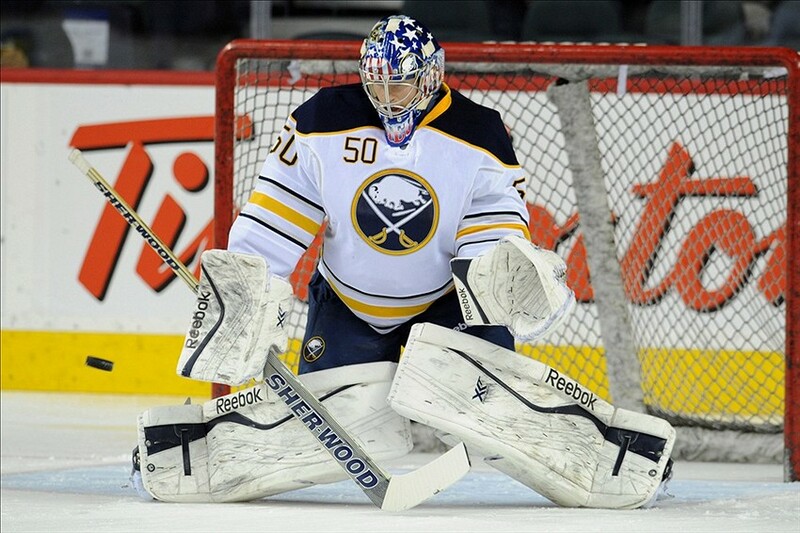 There are rumors that both Halak and Stewart may still be traded, but if Buffalo decides to keep them, they have a goalie who has been inconsistent, but who also was a star in a deep playoff run with Montreal a few years ago. Stewart is a power forward who is only 26 and can score, in addition to being a physical force. Carrier and the draft picks are bonuses, and who knows what other assets could be coming here if either Halak and/or Stewart are traded. Minnesota is rumored to be interested in Halak and Murray’s old team, the Ottawa Senators, are supposedly salivating at the chance to get Stewart. The bottom line is this – Murray made a bold move that Regier wouldn’t have had the guts to pull the trigger on in a million years, and did it without spending a lot of time being sentimental about the departing players. 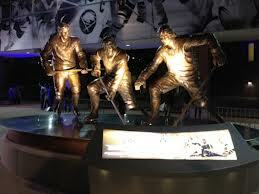 I see that as a positive, since the Sabres, Pegula included, have been mired in a sentimental journey into the team’s legacy, honoring past players by erecting statues. Even bringing back Lafontaine, to a degree, fed into that. The team has been a great part of the community throughout its’ history and had plenty of memorable moments, but they’ve never won anything, unless Presidents’ Trophies and Prince of Wales Conference titles are good enough. Murray is a fresh set of eyes for this organization, with no ties and no sentimental attachment to the past, and that’s a good thing. I’m excited to see what he can accomplish as a GM. The one concern I do have with Murray is what he will decide is the future of the other person I consider important to the team – Nolan. There are stories that claim Murray will want to bring in his own coach, and I suppose he has a right to do that. However, Nolan was asked to come here and attempt to right the ship, and he has more than answered the call. He inherited basically the same team as Roulston, and the difference in the play of that team between the beginning of the year under Roulston and now is like night and day. The three games since the Olympics have been amazing. Three wins under the cloud of the trade deadline engineered by a guy still holding the “interim” tag. The most impressive was Friday night’s win over San Jose. It was a bizarre game, with Miller and Ott pulled from the lineup less than an hour before the drop of the puck. The game telecast included an unreal scene where the intermission show between the first and second periods included a farewell press conference for the traded players. The Sabres, for the foreseeable future, are going to be a rebuilding project of trying to piece together young players into some semblance of a competitive NHL team. 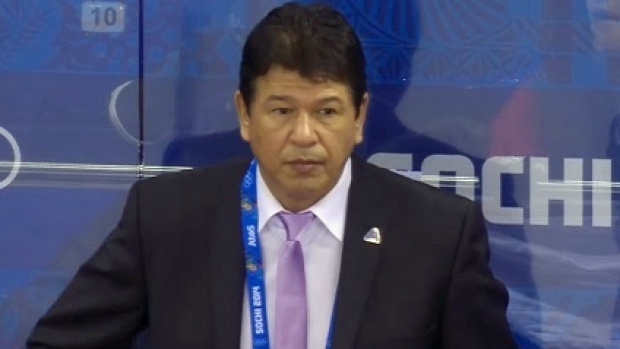 After watching the Latvian team in Sochi, is there any coach out there with better credentials to accomplish this job than Ted Nolan? It would be a crying shame if he is denied, for a second time in his career, the opportunity to finish a job he started. Ruff was finally put out of his misery, and the team summoned Ron Roulston from their Rochester AHL affiliate to finish the season as interim coach. He managed to steer the team to a better than .500 record, and was rewarded by having the interim title removed, as he becomes the permanent head coach next year. It was not a move that received much positive feedback from fans, justifiably in my opinion. Rolston’s strength is supposed to be developing young players, yet Tyler Myers, Tyler Ennis and Marcus Foligno seemed to regress, if that was even possible, after he took over. Under Rolston, the Sabres basically did the same thing they did for Ruff at the end of last year, rally from a slow, lazy start to the year to “almost” qualify for the playoffs. To me, the team continued to underachieve with Roulston as coach, and despite his barely winning record, some of the team’s worst performances of the year came on his watch (remember the Ranger game fiasco with Ryan Miller’s unprofessional, unfocused clearing attempt?) There were some positives for Roulston – two players he mentored in Rochester, Brian Flynn and Kevin Porter, were called up and made positive contributions. They at least laid the groundwork that they plan to compete for roster spots with some of the lazy incumbents on the roster next season. If the Sabres feel the need to continue the total housecleaning they started on trade deadline day, they should trade Miller. He’s 33 years old and really has never achieved “elite goaltender” status in my mind. Jonas Enroth’s play for Sweden in the recent IIHF tournament, where he had a 6-1 record with 2 shutouts and led his team to a gold medal win over Canada, is encouraging, and he should be given first crack at taking over in net if Miller is dealt. Also, the team has a pair of 23-year old prospects in their system who need to play – Matt Hackett (acquired in the Jason Pominville deal) and Connor Knapp. This is just an observation, but it seems that Sabre prospects (translation:Darcy Regier draft picks) are always “not quite ready to make the jump to the NHL”, and then either disappear into oblivion (out of hockey completely) or end up starring in another organization (see Dan Paille and Clark MacArthur). The 2 brightest lights among the forward lines this season were alternate captain Thomas Vanek and newly-acquired Steve Ott. Vanek is also mentioned in house-cleaning trade talk, but in my mind owner Terry Pegula should order Regier to get him re-signed for the balance of his career. The franchise has had a glaring need (basically for 40 years) for a winger who is not afraid to go to the front of the net, and Vanek is currently one of the league’s best at just that. Even if you decide on a youth movement, you need to keep a few veterans around to give fans some hope. Cody Hodgson also had a decent year statistically, and it will be interesting to see how he does in a full season. At this point, Ville Leino is a collossal free agent bust, but when healthy, he is a difference-maker and the team needs to give him a longer look. 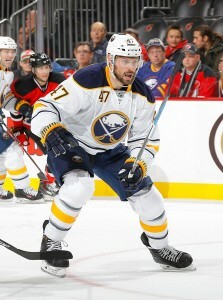 Patrick Kaleta knows his role and does it well, and Flynn and Porter’s play was encouraging. The rest of the forward line players are underachievers, the biggest offenders being Foligno and Drew Stafford. 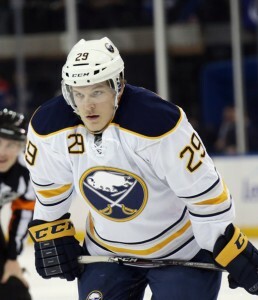 Luke Adam shows signs of progress at times, then plays his way back to Rochester. 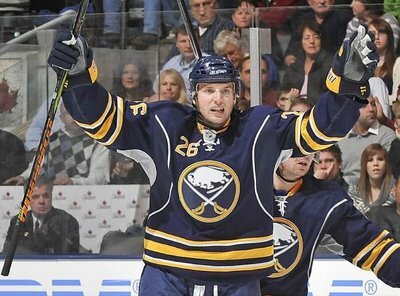 It will be a make-or-break season in 2013/14 for him and the smaller “speed” guys – Nathan Gerbe and Ennis. There are supposedly promising Regier draft picks waiting in the wings also – Mikael Grigorenko, Joel Armia and Zemgus Girgensens. If Regier is such a genius as a GM, then Sabre fans should expect these guys to develop into superstars, right? The team moved out a big chunk of experience on defense at the deadline, but has a pair of good leaders, Christian Ehrhoff and Andrej Sekera, to begin rebuilding the back line with. Tyler Myers needs to step up next season. He was given a huge contract, then showed up out of shape after the lockout ended and played terribly all year. He’s a good enough prospect that the club should overlook the shortened season and give him a chance at redemption. If he gets his head out of his derriere, he can be a big building block in the team’s rebuilding plans. Alex Sulzer is a decent, if not spectacular, player, and should compete for playing time, along with Mike Weber and Adam Pardy. The team has some interesting young players on defense also, including Mark Pysyk, Chad Ruhwedel and Braydon McNabb. They need a couple of these guys to develop into dependable top six defensemen next year. As the 2012 NHL season wound down last year, and it became apparent that the Buffalo Sabres were again going to miss the playoffs, I wrote 2 different posts on this blog, one titled “Why Lindy Ruff Should Be Fired” and “Lindy Ruff’s Last Stand”, both calling for the coach to be relieved of his duties, as that seemed to be the only way this stale franchise could be revived. Unfortunately, both Ruff and GM Darcy Regier are still running the show, and owner Terry Pegula, instead of following through on his promise to pursue the Stanley Cup, has remodeled the team’s locker room and built a monument to the French Connection line, a fitting tribute to the linemates who thrilled fans in past years, but also never won a Cup. My comment on Ruff after last season was that he should be fired, but that Pegula was obviously enamored with him so he’d be back this year, but would be on a short leash as fans would accept nothing less than a fast start and a team that contends for a playoff spot. Instead, the Sabres have been wildly inconsistent, and have been guilty of all kinds of defensive breakdowns while playing Ruff’s defensive “system”. The roster was remade to Ruff’s liking, as tough guys like Steve Ott and John Scott were added. The results have been the same, as the team continues to struggle and ranks in the bottom of the NHL standings. In the lockout-shortened 48-game season, no team can afford to play as inconsistently as the Sabres have and expect to make the playoffs. I also noted in that season-ending post that the players were grumbling on locker cleanout day about the way Ruff treats them – the biggest complainer, Derek Roy, was traded to Dallas for Ott – and that the players were grown men and certainly didn’t appreciate being treated like 5 year olds by their coach, with his childish punitive punishments for making mistakes. I had to shake my head when I read that during a practice session recently, if the players didn’t cover a shooter in time, they were forced to do push-ups. Ruff insisted it wasn’t “punishment”, and none of the players publicly complained, but I guarantee you they’ve had enough of that type of treatment. They need their coach to come up with some answers, which he hasn’t. 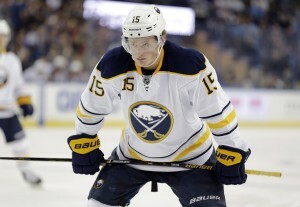 It’s a shame but it looks like the Sabres will muddle through to another non-playoff year. I can’t see Pegula rationalizing that away and continuing to support his coach and GM when the organization just keeps spinning its’ wheels. New Jersey Devils vs. Los Angeles Kings – the L.A. Kings will win the Stanley Cup because they are playing the best of anybody at the right time, and their goalie, Jonathan Quick is playing superbly. Captain Dustin Brown has been the best all-around player in the playoffs, and the Kings have the offensive firepower to wear down the Devils’ 41-year old goalie, Marty Brodeur. Los Angeles Kings vs Phoenix Coyotes – this is the Western Conference Final. I think this is going to be a close series. Both teams have good goalies – Jonathan Quick of the Kings and the Coyotes’ Mike Smith. But I think that the L.A. Kings are going to win, since they have more offense. New York Rangers vs New Jersey Devils – I think the Rangers are going to sweep the Devils in this Eastern Conference Finals matchup. Henrik Lundqvist is playing amazing, and the Rangers are the top ranked team remaining in the playoffs.